A method of allocating bandwidth is provided which involves for each sector of a plurality of sectors in a cell, using a respective subset of a total bandwidth; wherein for any two adjacent sectors, the respective subsets only partially overlap. A scheduling method is provided which involves for each sector, scheduling users for transmission on the respective subset of the total bandwidth by: for a given transmitter, allocating a respective fraction of capacity associated with the available bandwidth to each of at least two users selected from a plurality of users by performing an optimization for a selected scheduler design, the optimization selecting the at least two users and the optimization determining for each user the respective fraction of capacity; generating and transmitting a signal in which each of the at least two users has the respective fraction of capacity. This application claims the benefit of U.S. Provisional Application No. 60/386,477 filed Jun. 7, 2002. The frequency reuse-1 scheme is illustrated diagramatically in FIG. 1 where a cell generally indicated by  10 has three sectors 12, 14 and 16. All three of these sectors are operating on the same frequency band “F”. where T k is an average user throughput for user k over a long period of time and α and β are indices used to control the fairness for scheduling, applied for two users, or generalized to schedule N users in the transmission interval, where N>=3. 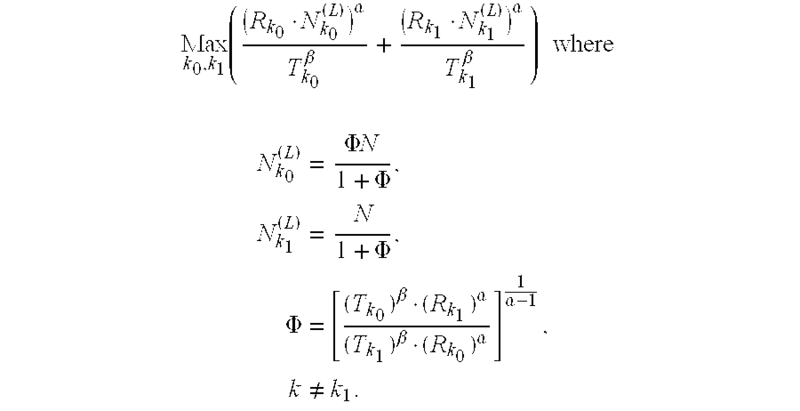 In some embodiments, the method further comprises using a Lagrangian of the optimization to obtain the following unconstrained optimization formula:  Max k 0 , k 1  ( ( R k 0 · W k 0 ( F i0 ) ) α T k 0 β + ( R k 1 · W k 1 ( F i1 ) ) α T k 1 β ) where   W k 0 ( F i0 ) = Γ   W 1 + Γ , W k 1 ( F i1 ) =  W 1 + Γ , Γ = [ ( T k 0 ) β · ( R k 1 ) α ( T k 1 ) β · ( R k 0 ) α ] 1 α - 1 , k 0 ≠ k 1 .
where T k is an average user throughput for user k over a long period of time and α and β are the indices used to control the fairness for scheduling. 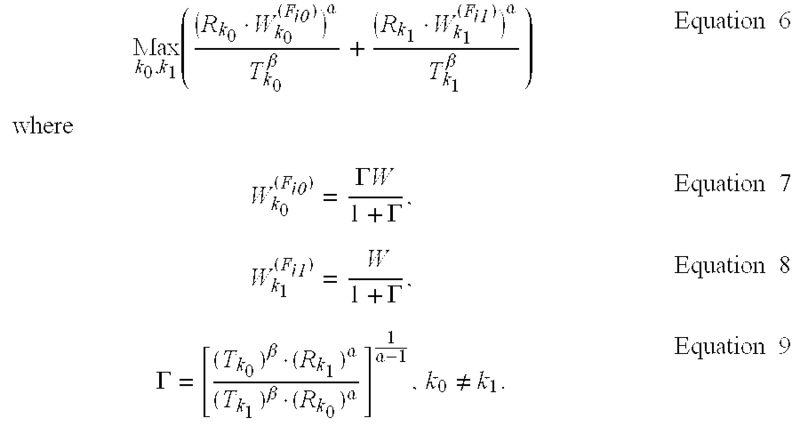 In some embodiments, the method further comprises using a Lagrangian of the above optimization to obtain the following unconstrained optimization formula:  Max k 0 , k 1  ( ( R k 0 · W k 0 ) α T k 0 β + ( R k 1 · W k 1 ) α T k 1 β ) where   W k 0 = Γ   W 1 + Γ , W k 1 =  W 1 + Γ , Γ = [ ( T k 0 ) β · ( R k 1 ) α ( T k 1 ) β · ( R k 0 ) α ] 1 α - 1 , k 0 ≠ k 1 .
can be obtained  R k 0 ( L ) = R k 0 · N k 0 ( L ) N R k 1 ( L ) = R k 1 · N k 1 ( L ) N .
where T k is an average user throughput for user k, and α and β are the indices used to control the fairness for scheduling. 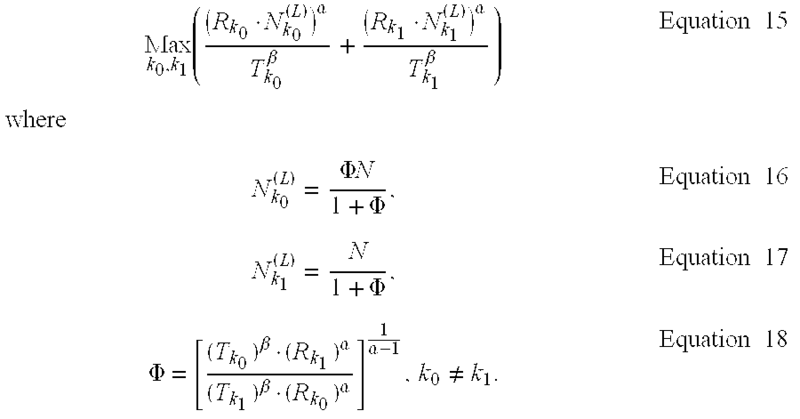 In some embodiments, the method further comprises using a Lagrangian of the optimization to obtain the following unconstrained optimization formula:  Max k 0 , k 1  ( ( R k 0 · N k 0 ( L ) ) α T k 0 β + ( R k 1 · N k 1 ( L ) ) α T k 1 β ) where N k 0 ( L ) = Φ   N 1 + Φ ,  N k 1 ( L ) =  N 1 + Φ ,  Φ = [ ( T k 0 ) β · ( R k 1 ) α ( T k 1 ) β · ( R k 0 ) α ] 1 α - 1 ,  k 0 ≠ k 1 . In other broad aspects of the invention, an apparatus is provided which implements any one of the above summarized methods. In some implementations the apparatus is implemented as part of a base station, antenna subsystem, Node-B, or multi-sector transmitter to name a few examples. FIGS. 8 through 11 provide simulation results. An example of frequency reuse-3 is shown in FIG. 2A. Here, a cell generally indicated by  20 has three sectors 22,24,26. Sector 22 is operating with frequencies F2 and F3. Sector 24 operates with frequencies F1 and F3. Sector 26 operates with frequencies F1 and F2. It can be seen that with this particular frequency assignment, adjacent sectors each have one(more generally at least one) frequency or sub-band in common and one (more generally at least one) frequency or sub-band which is not in common. Other numbers of sectors and/or sub-bands per cell may be employed. FIG. 2B is a very basic block diagram of a transmitter, such as a base station, adapted to implement the frequency reuse-3 plan discussed above. In this example, there are three sector transmitters, namely sector one transmitter  200, sector two transmitter 202 and sector three transmitter 204. Each transmitter is connected to respective sector antenna 206,208,210. Sector one transmitter 200 operates using frequencies F1,F3. Sector two transmitter 202 operates with frequencies F1,F2. Sector three transmitter 204 operates with frequencies F2,F3. User scheduling function 221 is shown. This is responsible for performing the above discussed optimization process to determine which users are to be scheduled and on which frequency for each sector. It is to be understood that different numbers of sectors and different numbers of frequency sub-bands could be employed. An example deployment of a number of cells with frequency assignments as shown in FIG. 2A is shown in FIG. 3. Here, each cell has sectors with sub-bands assigned in accordance with the above-described example. Furthermore, the cells are arranged such that the sectors of adjacent cells also include at least one sub-band assigned to the sectors which is not common between the pair. For example, cells  40 and 42 have sectors 44 and 46 which are adjacent. These sectors share sub-band F2, but sector 44 also includes sub-band F1 which is not in common with sub-band F3 of sector 46. FIG. 2C is a very simple flowchart for an example scheduling method. In this example, at step  2C-1 the geometry is determined for all users in the sector and for each sub-band allocated to the sector. Next, at step 2C-2, for each sector and sub-band, the user with the best geometry is selected such that no user is scheduled twice. While the figure assumes that the user geometry is employed for scheduling, it is to be understood that other performance parameters could alternatively be employed. FIG. 4 shows a cell  50 with three sectors 52, 54 and 56. Two users are assigned to sector 52 with frequencies F10 and F11 respectively. Similarly, two users are assigned to sector 54 with sub-bands F00 and F01 respectively. Finally, for sector 56 two users are assigned with sub-bands F20 and F21 respectively. While the actual values for each Fik can change from slot to slot, the sum of the assigned bandwidth in a given sector occupies a constant bandwidth. Furthermore, the bandwidth will share a portion of the bandwidth with adjacent sectors, but will also include a portion which is not in common. It is assumed that pairs of users in the serving sector are indicated by k 0 and k1 are to be individually selected to transmit the data in frequency band Fi0 and Fi1, with respective bandwidths of W k 0 ( F i0 )   and    W k 0 ( F i1 ) . It is further assumed that the transmission rate for each selected user in each slot is R k 0 and Rk 1 , when using the entire frequency bandwidth W.
This is illustrated in FIG. 5A where a total frequency bandwidth, W is indicated at  70 and this is divided into two bandwidths 72, 74 which are assigned to user k0 and k1 respectively. where T k is the average user throughput over a long period of time (for example, in 1xEV-DV, it is over 1.5 seconds), and α and β are the indices used to control the fairness for scheduling. Note that the ratio of Rk α/Tk β is used to determine an active user based on the conventional proportional fairness scheduling. FIG. 5B is a block diagram of a transmitter adapted to implement the above discussed optimization process. Shown is a sector transmitter  502 and optimization process 500. An input to the optimization process 500 is any parameters required for the process, such as α and β in the above discussed example. These could be hard coded into the system. Another input to the process are the above discussed user specific values Tk and Rk which are maintained, for example in memory 504. The output of the optimization process 500 consists of values k0, Wk 0 and k1, Wk 1 . These values are used by the sector transmitter 504 to obtain the appropriate amount of transmit data from each user and to generate the appropriate transmit signal for transmission over transmit antenna 506. This is shown by way of example in FIG. 6 where the data bits (more generally symbols) for user k 0 are generally indicated by 80 and the data bits for user k1 are generally indicated by 82. Depending upon the fraction of bandwidth assigned to each user, the number of bits (symbols) each user will be allowed to transmit will be different. The users bits (symbols) are mapped in the time domain to sequence 84. After OFDM modulation, these bits (symbols) are mapped to OFDM symbol 86. It can be seen that for the OFDM embodiment, the frequency bandwidth assigned for a given sector will not necessarily be divided into contiguous blocks to be used by each user. Rather, each sector will have a respective band which may or may not overlap partially or completely with the band used by adjacent sectors and the users selected to transmit on the band of that sector will have their data spread throughout the band. where N k 0 and Nk 1 are the number of bits for user k0 and k1 transmitted. It is noted that for the OFDM embodiment, the entire frequency band is shared by the users, so it is more proper to not refer to frequency bands Fi0 and Fi1 for this embodiment. 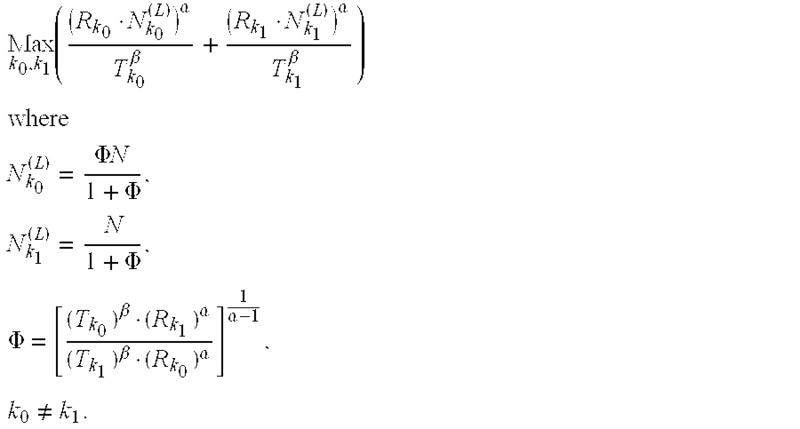 All of the above equations are the same, except these frequency band references can be removed. FIG. 6B is a block diagram of an OFDM base system employing optimization as provided by an embodiment of the invention. Shown here again is optimization process  600 which performs optimization as a function of input values Tk, Rk indicated generally at 606. However, in this case the values Rk are determined by obtaining SNR readings 604 (or other suitable quality measures) for each mobile station, and then for each mobile station determining a rate to be employed based on adaptive coding and modulation, as indicated generally at 602. With the rates thus determined, the optimization process 600 proceeds to generate values Nk 0 , k0, and Nk 1 , k1. These values are fed to a bit selector (more generally symbol selector) function 608 which is responsible for obtaining the required number of bits from the selected users. It is to be understood that there would be many methods of implementing this, but it simply amounts to obtaining Nk 0 bits from user k0 and obtaining Nk 1 bits for user k1. These bits are fed to an OFDM transmitter 610 which generates an OFDM signal and transmits this on antenna 612. Further details of the bit selection and OFDM transmission are provided in FIG. 6C. Here, the bit selector 608 is shown to have the above discussed input 601 output by the optimization process 600, and also has the user input data streams 609. The appropriately selected bits, generally indicated at 611 are fed to the OFDM transmitter 610. These bits are combined and interleaved by multiplexer 620 and interleaver 622 and fed to an IFFT function 624 which generates the signal for transmission over antenna 612.
where T k is the average user throughput, and α and β are the indices used to control the fairness for scheduling. Note that the ratio of Rk α/Tk β is used to determine an active user based on the conventional proportional fairness scheduling. FIG. 7B is a block diagram of a system in which the Walsh code selection is employed. Here, again the optimization process is indicated generally at  702 and this generates an output 703 consisting of an identification of two users and a corresponding number of Walsh codes for each user. These values are input to the bit selector 704 which selects the bits from the user input streams and passes these to a CDMA transmitter 708 which generates the CDMA signal using the appropriate number of Walsh codes for each user. The output is then transmitted on transmit antenna 710. As before, the input to the optimization process in this case consists of values Tk, and Rk, generally indicated at 706.
wherein for any two adjacent sectors, the respective subsets only partially overlap. for each sector, allocating the respective subset to be at least two of the fixed sub-bands. 3. A method according to claim 1 wherein the fixed sub-bands are equal in size. in each sector, transmitting a respective user transmission on each of the sub-bands. for pairs of sectors that face each other of different cells, allocating respective subsets which only partially overlap. 6. A method according to claim 1 for application in three sector cells, wherein two thirds of the total frequency bandwidth is allocated to each of the three sectors such that each sector shares one third of the total frequency bandwidth with each adjacent sector. generating and transmitting a signal in which each of the at least two users has the respective fraction of capacity. 8. A method according to claim 7 wherein the optimization is performed every transmission interval, and the optimization maximizes sector throughput. proportional fairness, proportional fairness for FTP traffic, adaptive scheduler, adaptive scheduler for video service. 10. A method according to claim 7 wherein the optimization performs a maximization of proportional factors relative to user transmission rate and average user throughput, while keeping a total frequency bandwidth constant. 11. A method according to claim 7 further comprising in performing the optimization, using an unconstrained optimization obtained by using a Lagrangian of a constrained optimization. performing optimization which maximizes sector throughput, applied to two users per sector or generalized to N users per sector, where N>=3. where Tk is an average user throughput for user k over a long period of time and α and β are indices used to control the fairness for scheduling, applied for two users, or generalized to schedule N users in the transmission interval, where N>=3. Max k 0 , k 1  ( ( R k 0 · W k 0 ( F i0 ) ) α T k 0 β + ( R k 1 · W k 1 ( F i1 ) ) α T k 1 β )   where   W k 0 ( F i0 ) = Γ   W 1 + Γ , W k 1 ( F i1 ) = Γ   W 1 + Γ , Γ = [ ( T k 0 ) β · ( R k 1 ) α ( T k 1 ) β · ( R k 0 ) α ] 1 α - 1 , k 0 ≠ k 1 .
in each sector, transmitting an OFDM signal using the respective subset of the total OFDM bandwidth. generating the OFDM signal from content of at least two users. converting the time domain representation into the OFDM signal. 18. A method according to claim 17 wherein mapping symbols from each user into a time domain representation comprises interleaving. for each sector, performing an optimization to identify the at least two users, and to determine for each user a respective number of symbols to be mapped into said time domain representation. 21. A method according to claim 20 wherein the optimization is performed every transmission interval, and the optimization maximizes sector throughput. 23. A method according to claim 20 wherein the optimization performs a maximization of proportional factors relative to user transmission rate and average user throughput, while keeping a total frequency bandwidth constant. 24. A method according to claim 23 further comprising in performing the optimization, using an unconstrained optimization obtained by using a Lagrangian of a constrained optimization. 25. A method according to claim 20 wherein the signal is an OFDM signal, the method further comprising generating the OFDM signal from content of at least two users by mapping with interleaving bits from each user into a time domain representation and converting the time domain representation into the OFDM signal. 26. A method according to claim 25 wherein for each sector, the optimization determines for each of the selected users a respective number of symbols to be mapped into the time domain representation, the respective number of symbols comprising said respective fraction of capacity. 27. A method according to claim 25 wherein the optimization performs a maximization of proportional factors relative to user transmission rate and average user throughput, while keeping a total frequency bandwidth constant. performing optimization which maximizes sector throughput. 29. A method according to claim 28 generalized to schedule N users per sector, where N>=3. 31. A method according to claim 30 wherein the channel quality indications comprise SNR (signal-to-noise ratio) values. where Tk is an average user throughput for user k over a long period of time and α and β are the indices used to control the fairness for scheduling. 33. A method according to claim 32 generalized to schedule N users in the transmission interval, where N>=3. Max k 0 , k 1  ( ( R k 0 · W k 0 ) α T k 0 β + ( R k 1 · W k 1 ) α T k 1 β )   where   W k 0 = Γ   W 1 + Γ , W k 1 = W 1 + Γ , Γ = [ ( T k 0 ) β · ( R k 1 ) α ( T k 1 ) β · ( R k 0 ) α ] 1 α - 1 , k 0 ≠ k 1 . 35. A method according to claim 32 generalized to schedule N users in the transmission interval, where N>=3. 37. A method according to claim 20 wherein said signal is a CDMA signal, the method further comprising generating the CDMA signal from content of at least two users by modulating content of each user to a respective subset of a set of orthogonal codes. 38. A method according to claim 37 wherein for each sector, the optimization determines for each of the at least two users a respective number of orthogonal codes in the respective subset, the respective number of orthogonal codes comprising said respective fraction of capacity. 39. A method according to claim 38 wherein the optimization performs a maximization of proportional factors relative to user transmission rate and average user throughput, while keeping the total frequency bandwidth constant. 41. A method according to claim 40 generalized to schedule M users each scheduling period. 42. A method according to claim 40 wherein proportional fairness as a user scheduler is employed, and the optimization maximizes a proportional factor relative to user transmission rate and average user throughput, while keeping the total number of orthogonal codes constant. where Tk is an average user throughput for user k, and α and β are the indices used to control the fairness for scheduling. Max k 0 , k 1  ( ( R k 0 · N k 0 ( L ) ) α T k 0 β + ( R k 1 · N k 1 ( L ) ) α T k 1 β )   where N k 0 ( L ) =  Φ   N 1 + Φ , N k 1 ( L ) =   N 1 + Φ , Φ =  [ ( T k 0 ) β · ( R k 1 ) α ( T k 1 ) β · ( R k 0 ) α ] 1 α - 1 , k ≠  k 1 . 45. A method according to claim 37 wherein the orthogonal codes are Walsh codes. a respective transmitter and antenna for each sector of a plurality of sectors in a cell, each transmitter using a respective subset of a total bandwidth, wherein for any two adjacent sectors, the respective subsets only partially overlap. 47. A apparatus according to claim 46 wherein each transmitter is adapted to transmitting a respective user transmission on each of the sub-bands. for a given transmitter, allocating a respective fraction of capacity associated with the available bandwidth to each of at least two users selected from a plurality of users by performing an optimization for a selected scheduler design, the optimization selecting the at least two users and the optimization determining for each user the respective fraction of capacity. 49. An apparatus according to claim 48 wherein the optimization process uses an unconstrained optimization obtained by using a Lagrangian of a constrained optimization. 50. An apparatus according to claim 46 wherein each transmitter comprises a respective OFDM transmitter adapted to generate a respective OFDM signal using the respective subset of the total bandwidth. 51. An apparatus according to claim 50 wherein each OFDM signal is generated from content of at least two users. an IFFT function for converting the time domain representation into the OFDM signal. 53. An apparatus according to claim 50 further comprising an optimizer for performing an optimization in each sector to identify the at least two users, and for each user a respective fraction of symbols to be mapped into said time domain representation. 55. An apparatus according to claim 54 wherein said signal is an OFDM signal, said signal generation circuitry comprises a symbol selector for selecting symbols for each user and mapping them to a time domain representation, and an IFFT function for mapping the time domain representation into a frequency domain representation. 56. An apparatus according to claim 54 forming part of a multi-sector transmitting apparatus in which for each sector of the multi-sector transmitting apparatus a respective subset of a total bandwidth is used, wherein for any two adjacent sectors, the respective subsets only partially overlap. a plurality of Walsh code spreaders adapted to perform Walsh code spreading with a respective Walsh code of a set of Walsh codes, wherein the CDMA signal is generated from content of at least two users by modulating content of each user with a respective subset of the set of Walsh codes. 58. An apparatus according to claim 57 the optimizer determines for each of the at least two users a respective number of orthogonal codes in the respective subset, the respective number of orthogonal codes comprising said respective fraction of capacity.